March Madness is under way, with 32 games over two-days to kick off what is arguably the most exciting portion of the annual NCAA men’s college basketball tournament. Leading to the crowning of the National Champion in Arlington, TX on April 6. For anyone that’s watched the tournament on the many Viacom-owned channels where it is airing, you’ve noticed the multiple commercial breaks and the numerous brand mentions. In just the last few years, the number of commercials airing during the tournament has increased – particularly during the jammed-packed round of 64. Considering the first round of the tournament was ,until recently, aired on only one public channel – switching back and forth between the simultaneous games – there wasn’t a lot of room for ad space. However, airing full games of multiple channels – CBS, TBS, TNT and TruTV –naturally opens up room for more. In fact, just last year, this new strategy helped March Madness rake in more TV ad revenue than any of the other postseason broadcasts for the four major U.S. professional sports league. In the chart below, you’ll see that March Madness alone accounts for more TV ad dollars than the NBA and NHL combined and over twice as much as MLB – America’s supposed pastime. The most surprising fact, of course, is how the NCAA men’s basketball tournament stacks up against the revenue juggernaut that is the National Football League, besting it by a slender margin – if we consider $51 million “slender.” NFL games are notoriously heavy on commercial content – especially in the postseason. If you also factor in the length of NFL games (60 minutes versus college basketball’s 40 minutes) with the number of game stoppages – timeouts, punts, turnovers, kickoffs, scores, etc – an NFL game could be twice as long as an NCAA tournament game. However, it’s still tough for the NFL’s 11 postseason games to compete with the NCAA’s 67. Even with that, it’s still a surprising feat for March Madness. The Super Bowl is one of most-watched television events of the year, with many people tuning in specifically for the commercials. For the most recent Super Bowl, a 30-second spot was reportedly going for a record $4 million. And there’s a lot of room to be had in a four-hour game broadcast. Obviously, we’ll have to wait until next year to see how 2014 NCAA Tournament stacked up against the NFL, but expect it to remain in the same vicinity. The most interesting thing about these numbers, though, is that it only accounts for TV ad revenue, not online ad revenue. The NCAA Tournament reportedly costs business over $1 billion in lost productivity because of the numerous people following along during business hours – many of which on their work computers. 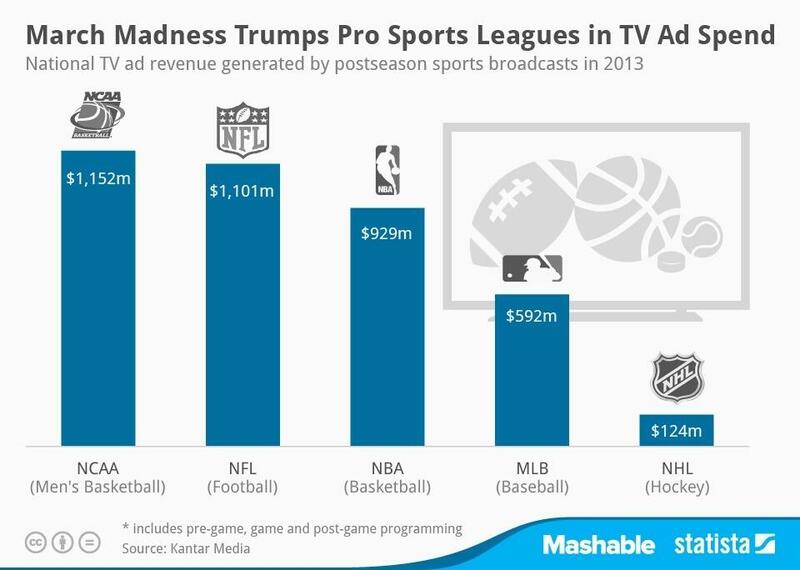 If you factor in those figures, there’s no question that March Madness is the top sports postseason for generated ad revenue. Error - Error validating access token: Session has expired on Tuesday, 06-Feb-18 09:00:00 PST. The current time is Friday, 19-Apr-19 17:40:20 PDT.